Every Thursday afternoon in a dark classroom at North Kirkwood Middle School (NKMS), Dr. David Holley, former KHS principal, begins class by playing “The Song of Your Heart” which first caught his eye during a drive back from Colorado after Christmas. In a fairly quiet setting, Holley stands in front of the classroom and breathes heavily in and out as he attempts to alleviate stress from a group of seventh grade girls. After 35 years of working in KSD, Holley decided it was time to take a step back from education and hand over the responsibility to someone else. He spent five years away from the community, spending his summers at his home in Colorado where he enjoyed walking his dogs, playing golf and volunteering for a school in Denver once a week. After taking some yoga classes, Holley received a call from his yoga instructor who said he should go through the training to become a yoga teacher due to the lack of male teachers in the area. At first Holley was opposed to the idea, but he had a discussion with Gina Woodard, KHS health teacher, which changed his perspective. Holley had to complete 200 hours of certification before becoming a licensed teacher. One weekend a month for nine months he learned about the body, the poses and what the poses do for your body. But after this introduction to yoga, Holley said he still felt like he knew nothing. Along with teaching at NKMS, he also leads students in the KHS ATLAS program. But Holley said he noticed more of an impact in the middle school girls. ATLAS kids can come if they have finished their work and have time, but these middle schoolers choose to put yoga into their schedules, Holley said. Hannah Moore, seventh grader, has attended Holley’s class since the beginning and has begun to appreciate the importance of coming back week after week. Holley’s teaching does not just have an effect on the six or seven girls at NKMS. Every Tuesday after school, he leads a yoga class for the staff at KHS. Regular attendees include Gina Woodard, Randy Kriewall, math teacher, and Dr. June Bourque, science teacher. Even though they have only had the class for a few months, the room seems to get more crowded each time, Woodard said. But no one notices, as the teachers are grateful to have quiet time after sometimes long and stressful days. As a principal, Holley was seen as an effective leader by Woodard and nothing seems to have changed since he retired in 2011. At the start of every class, he first asks about everyone’s well-being and mental health. 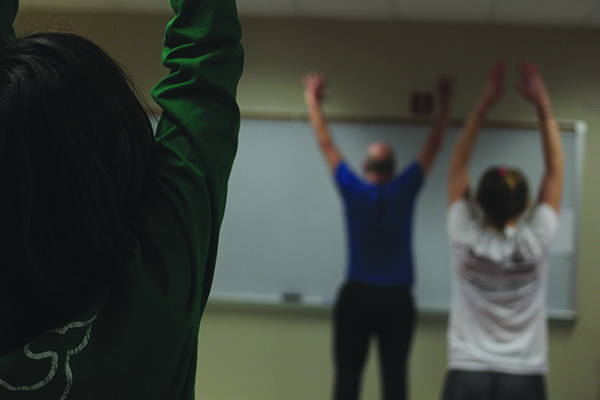 Even though Holley has been teaching for less than a year, his yoga instruction has already made an impact on the KHS community. He has also noticed an improvement in his own health because he found yoga that was fit for a 67-year-old man.